According to the Zambian Open Schools Organization (ZOCS), over one million school-age children in Zambia are not enrolled in school. Even though the government provides many primary schools, the numbers are insufficient to support the 1.4 million orphans. 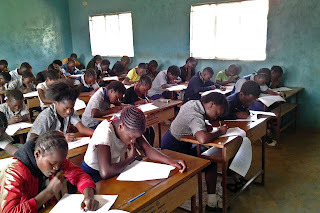 Community schools, like HealthEd Connect's, support approximately 30 percent of the total number of children in Zambia . But every school is not created equal!! And, I might add, 100% pass rate on the recent 7th grade standardized exam. Congratulations to the Young Peace Maker School at Chipulukusu for yet another honor! !